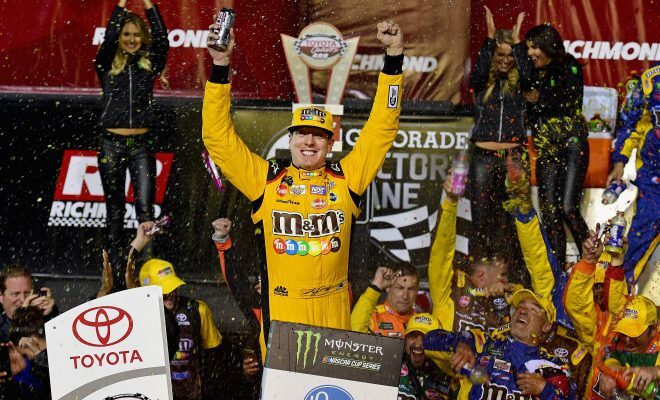 RICHMOND, VA — Taking advantage of late cautions at Richmond Raceway, Kyle Busch won the Toyota Owners 400 for his third consecutive Monster Energy NASCAR Cup Series win. He earned his fifth victory at track by driving from 32nd to first. “We started in the back because I screwed up qualifying. It was a crew chief error,” said Adam Stevens, Busch’s crew chief. Regarding the three consecutive wins, Busch said, “it’s definitely cool;” however, he also said he doesn’t “know if you can shoot for four in a row.” With the craziness of Talladega looming on the horizon it’s understandable to not set any goals. Though he started in row 16, Busch drove his way to the top-10 by lap-34. For the next-327 laps, Busch hovered in the top-10. When the flurry of late race cautions began he had worked his way into the top-five. In a race featuring only stage ending cautions until lap 355, a long run car was needed to move up through the field. Raw speed on the short run was still essential, as the race 400 lap race had four restarts within the final-39 laps. Chase Elliott and his short track rival, Denny Hamlin crossed the start/finish line directly behind Busch — Elliott was half a second behind the race winner. Joey Logano, after leading 92 laps and finishing fourth, said, “I wish I could rerun that. I feel like we can do better if we tried again. When the Toyota Owners 400 started, pole sitter, Martin Truex Jr. quickly jumped to a one second lead. Logano, who began the race second was slow to start. He drifted high around turns one and two, losing multiple positions, but after about ten laps he was back to second. At one point, early in the first run of the race, Chase Elliott put the bumper to Kyle Larson in turn-one for the third position; the drivers were three seconds behind the leader at the time. Within twenty laps Truex began lapping cars. Harrison Rhodes, Reed Sorenson, and Gray Gaulding were the first drivers to lose a lap. On lap-37, Logano passed Truex for the lead in turn-one. He had one of the best long run cars on the three-quarter-mile track. Ricky Stenhouse Jr. short pitted the field on lap-58. The Roush-Fenway Racing driver went two laps down but by lap-92 he had driven back onto the lead lap. Kurt Busch caught leader, Logano with 12-laps left in the first stage. The traffic that had slowed Logano then stalled Kurt, giving Aric Almirola an opportunity to make a pass for second place. Almirola was only half a second behind after the 100-lap opening stage. The stage was run without any caution periods. Logano earned his first playoff point of the year with the stage win. Kurt Busch passed Logano around the outside on the first lap of stage two. A few drivers pitted on lap 157, hoping to mimic Stenhouse’s stage-one strategy, McMurrary and McDowell were the most notable of those drivers. Bowyer went around Kurt on the outside on lap 170. By lap 181, Logano also went around the eldest of the Busch brothers, for second. Almirola joined the now four-way battle for the lead with 12 laps to go in the second stage. At the same time, Alex Bowman was being lapped for the second time of the evening, but he didn’t give the leaders much room to work with. Bowyer gave him a nose tap in turn-one, Logano pushed him down the back stretch and then up the track in the middle of three and four. A handful of laps later, Logano made a pass for the lead. No lead lap car was able to get around Logano in the final seven laps in stage two, but with two laps left in the stage McMurray drove around the gaggle of leaders, un-lapping himself. Joey Logano won the second stage, earning maximum bonus points for the evening. A trio of Stewart-Hass Racing drivers, Bowyer, Almirola, and Kurt Busch finished second, third, and fourth, respectively. Rookie driver, William Byron finished the second stage in fifth, giving himself a pair of top-fives for the first two stages. Under the caution, Byron was charged with speeding on pit road; the 20-year-old never regained all of the lost track position. During the stage break, Tony Stewart keyed up his team’s spotters and talked about not racing each other so hard. Stewart thought Bowyer and Kurt over worked there tires, giving Logano the opportunity to catch and pass them. To start the third, and final stage of the race, Kurt Busch passed Logano for the lead. Twenty laps later Logano was passed by Bowyer, droppig him to third. Not long after Truex went around on the inside. On lap 252 Bowyer went around Kurt for the lead. The first five drivers, Bowyer, Kurt Busch, Truex, Kyle Busch, and Harvick, were within 2.4 seconds of each other, 48 laps after the race had gone back green. Green flag pitstops commenced on lap 270. Logano, and Truex were among the first to come in. Leader, Bowyer came down pit road on lap 273. Stenhouse and Darrell Wallace Jr. had commitment line violations while entering pit road. They both were assessed a penalty, regulating them to top-25 finishes. After the sequence of pitstops, Truex emerged as the race leader. Kurt Busch, who had been running inside the top-five all evening had an air gun pulled by Daniel Suarez’s car, slowing the pitstop and dropping him back to eighth. On lap 351, after two sets of green flag pit stops and 143 consecutive green flag laps, the top-four cars were within 2 seconds of the leader. It was a true testament to the level of competition and parity in the premier NASCAR series, but the long run didn’t last forever. Ryan Blaney was tapped by Stenhouse in turn-3 on lap 355. Blaney spun around, he hit Cole Whitt – a back marker who had been running a lane higher – and slid down the track to collect Stenhouse. Brad Keselowski narrowly missed Stenhouse, ducking between the stopped car and the outside pit road wall. Suddenly, on the ensuing restart, Kyle Busch moved to second. This was the highest he’d run all evening. McMurry, Kyle Larson and Newman tangled coming off a turn two on lap 367. Newman began bellowing smoke, forcing NASCAR to throw a caution for fluid on the track two laps later. McMurray was upset with Larson, because his younger teammate ran into the back of him when the cars scuffled. Under the caution McMurray drove into the right side of Larson’s car. Minutes later his spotter explained to him, Kurt Busch was actually the driver who’d pushed him up to the wall. Larson just didn’t have anywhere to go but into the back bumper of the No. 1 Chevrolet. On the restart with 22 laps to go, Kyle Busch burst out to a half second lead over Truex. There was three, and nearly four-wide racing just outside the top-10. With a few more than ten laps to go, David Ragan backed his car into the turn-three wall. All of the leaders elected to pit, but Truex had a slow stop and lost numerous positions. The race again restarted, but one last yellow flag flew over the speedway when Stenhouse slapped the turn three wall.